The NRC regulations require that nuclear power plants be designed to withstand the effects of natural phenomena such as earthquakes, tornadoes, hurricanes, floods, and tsunami. 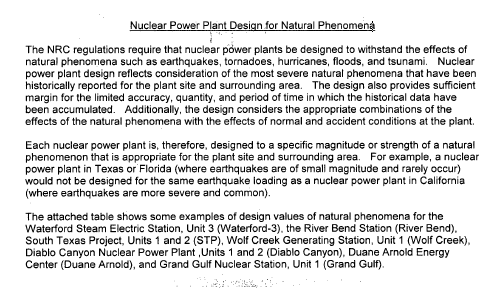 Nuclear power plant design reflects consideration of the most severe natural phenomena that have been historically reported for the plant site and surrounding area. The design also provides sufficient margin for the limited accuracy, quantity, and period of time in which the historical data have been accumulated. Additionally, the design considers the appropriate combinations of the effects of the natural phenomena with the effects of normal and accident conditions at the plant. Each nuclear power plant is, therefore, designed to a specific magnitude or strength of a natural phenomenon that is appropriate for the plant site and surrounding area. For example, a nuclear power plant in Texas or Florida (where earthquakes are of small magnitude and rarely occur) would not be designed for the same earthquake loading as a nuclear power plant in California (where earthquakes are more severe and common). 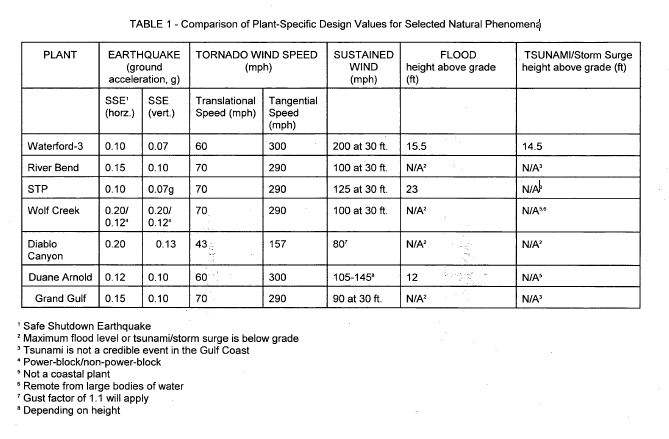 The attached table shows some examples of design values of natural phenomena for the Waterford Steam Electric Station, Unit 3 (Waterford-3), the River Bend Station (River Bend), South Texas Project, Units 1 and 2 (STP), Wolf Creek Generating Station, Unit 1 (Wolf Creek), Diablo Canyon Nuclear Power Plant ,Units 1 and 2 (Diablo Canyon), Duane Arnold Energy Center (Duane Arnold), and Grand Gulf Nuclear Station, Unit 1 (Grand Gulf).